The New York City Writing Project remains committed to supporting teachers in finding and developing the necessary resources to engage their students in classroom conversations and inquiry surrounding the current movement for justice in our country. If you would like to contribute to this compilation, please email admin@nycwritingproject.org. This collection asks: What’s the pilot light in our curriculum that helps students to connect around important issues of race and justice in our time? A significant portion of this text was published by Paul Alison, NYCWP Tech Liaison, Coordinator of our Youth Voices Programming, and host of the Teachers Teaching Teachers webcast at the National Writing Project’s Digital Is. For the original text, please visit http://digitalis.nwp.org/collection/ferguson. The NYCWP is grateful to Paul for sharing these resources with our wider community and to the NWP for publishing his essay. Another way to ask this question: How do we build curriculum, rituals, tools, and skills in modular, open, inspiring ways that will give students the permission to follow their passions, yet also invites them to go deep into important issues as committed and informed citizens? In the wake of multiple shootings of unarmed young men of color, and in the Grand Jury decisions to not indict the police officers who murdered Michael Brown (Ferguson, MO) and Eric Garner (Staten Island, NY), teachers are looking for ways to discuss these events with their students. Though these events are extremely difficult, they are also extremely important. 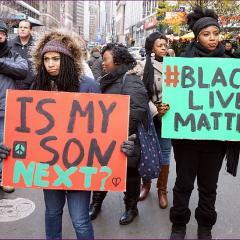 Older students may be using social media outlets like Twitter to communicate their feelings; they might be following hashtags such as #BlackLivesMatter, #FergusonDecision, #JusticeforMikeBrown, #JusticeforEricGarner and #NYCtoFerg (which tracked NY-based protests to the Ferguson decision). But younger or less-connected students who might be following the events in the press may not have a digital outlet. How do we ensure that their voices are heard, their fears and feelings validated and–most importantly–that the students we teach can become agents of change for their generation if they so desire? Both teachers and students are likely to have a wide range of feelings about what they’ve been hearing: they may feel angry, scared, hurt, depressed, frustrated, voiceless, confused, or any number of things. As educators, we can’t sweep these major events under the rug; it is our job to facilitate conversations with our students so that we can all learn from the history that is being created in this very moment. How can we use social reading tools like http://genius.com and http://nowcomment.com to engage students in critical, close reading and collaborative inquiry? How can we use resources such as those in this collection to see if we can move our conversations and our curriculum about race into the kinds of institutional and structural work that is suggested by the researchers at Race Forward? One of the resources here hightlights our conversations about #BlackLivesMatter On Teachers Teaching Teachers (TTT). We have been thinking about how Ferguson and the movements for racial justice impact on our classrooms and in our interactions with students and with each other. On a recent episode, Chris Rogers pointed us to Race Forward’s research “because racism has levels” he wrote in a chat. We have been studying their report Moving the Race Conversation Forward and creating learning experiences for our students in which they can do similar kinds of research and perspective-taking. This institute’s work around Preventing Racial Inequity in Schools and Beyond has become an important area of inquiry for the Youth Voices/Teachers Teaching Teachers network of educators. This is what we have been talking about on Teachers Teaching Teachers and building into our missions on Youth Voices: how to introduce Race Forward stances, protocols, and practices into our classrooms. And further, we are asking how we can use Youth Voices, Hangouts On Air, and other tools such as NowComment and Genius to have conversations across schools. Our segregated school systems too often lead to students having these conversations mainly with peers who are a lot like each other. We seek–mainly through Youth Voices–to break down some of these walls. I’ve also been working on a Gooru collection of resources around Selma: http://bit.ly/1tBpcJS. 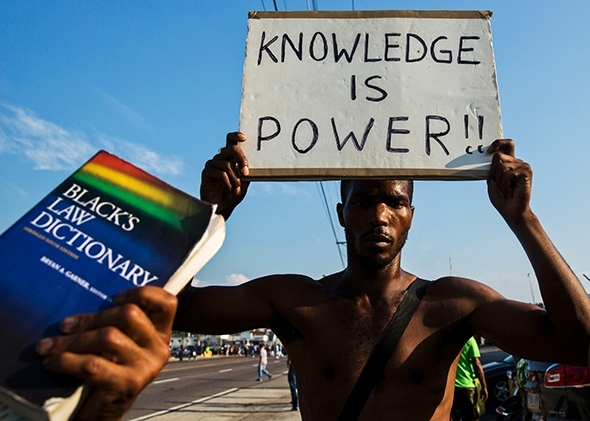 And the exciting bevy of resources out there attached to the #fergusonsyllabus is an ongoing inspiration. We invite you to join us as we make plans for students to exchange their stories, views, poems, and ideas on Youth Voices. We invite your students to connect with the youth using the resourses in this collection and in spaces like these on Youth Voices to connect, talk, and organize: http://youthvoices.net/michaelbrown | http://youthvoices.net/blacklivesmatter | http://youthvoices.net/takingastand. And please remember to join our little corner of the movement on Teachers Teaching Teachers every Wednesday at 9pm Eastern/6pm Pacific at http://edtechtalk.com/ttt. Photo illustration by Slate. Photos by Lucas Jackson/Reuters and Thinkstock. #FergusonSyllabus took over Twitter and Instagram this summer as teachers hashed out in their communities how–if at all–to deal with Ferguson in their classrooms. The resources have since grown to address other related murders, such as Eric Garner, Tamir Rice, Rumain Brisbon, and Akai Gurley (among others). It, alongside #BlackLivesMatter, has marked a significant social movement that is growing by the day. Several episodes of the Teachers Teaching Teachers (TTT) webcast have focused on bringing these issues into the classroom. Give students time to express how they feel in silent journal writing. You might want to share prompts that can be optional for students to respond to. Make art. Collage is a great activity; making something whole out of broken/torn pieces can be therapeutic. In their work, students can ask a question, honor the life of one of the slain, or make a powerful statement. Besides images, I often provide quotes, lines from poems, and famous speeches for students to use if they want. Listen to a freedom or protest song and discuss it. Ask students to think about why musicians make these types of songs. What lyrics would they write if they created a song about what’s happening now? Refer students to get more support, if needed. For teachers who might feel uncomfortable talking in depth about the recent events in our nation or feel like students need more support than they can give, refer students to the school counselor or arrange for a guest to come in. Share picture books. There are great titles to introduce younger grades to social justice. Visit www.usingtheirwords.org for a list of books recommended for grades K-5 by pre-service teachers. One of the take-aways from that conversation was to be reminded of the power of http://youthvoices.net for our students. It’s important to see and hear the views of students from different communities. The students in Chris Sloan’s classes in Salt Lake City and the students in Jo Paraiso’s classes in Oakland and my students in the Bronx are relatively homogeneous, and they can learn a lot from talking with students outside of their immediate school communities — especially on issues of race. 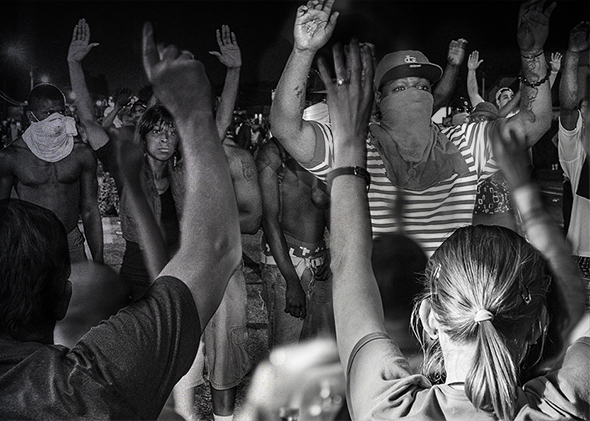 A week later, TTT revisited the conversation about Ferguson with Christopher Emdin as a featured participant. For educators, one way to establish norms with young people and set the appropriate tone for the school year is to focus instruction on events and issues that mean something to students. This is particularly important for youth of color, given the Michael Brown shooting and the recent events in Ferguson, Missouri. The entire article can be found at the link, and the TTT episode featuring Emdin can be viewed below. This collection on Gooru is available for anybody to use with students and contains materials appropriate for discussing Ferguson and Michael Brown. Teaching For Change has a good article with a lot of links (most of them Rethinking Schools links), resources and ideas about how to address Ferguson with your class and encourage them to become proactive in their communities. NPR’s On The Media’s most recent show has several sections analyzing the media coverage surrounding the events in Ferguson. The Anatomy of Six Shootings quickly breaks down the pattern of the media, political and social response to recent highly publicized shootings of young black men. Live Coverage’s Impact on the Ground and The Media Came to Town focus on how local news made choices about how to cover the event and the interactions with national media. The Global View of Ferguson contrasts how media in other countries are covering the story with more criticism and historical context. NYCWP Teacher-Leader Priscilla Thomas also covers the matter on her blog, Those Who Can. “Teaching About the Jordan Davis Murder Trial.” is a great related resource that can be found on Edutopia. The SLJ post, which is excerpted above, also details several additional lessons and conversation-starters that can be used with students. We would love to hear from you, either in the forums or by email, about this essential topic. This page will be updated as events progress and as additional resources become available. Please share your thoughts and resources with our community.